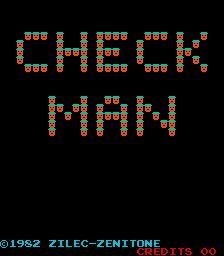 Check Man © 1982 Zilec-Zenitone. Commercial remakes on home computer : Danger UXB by Micropower on the BBC Micro/Acorn Electron. Released by JALECO in Japan. Clearing a square by walking over it : 10 points. Collecting flags : 500, 1,000, 1,500, 2,000 points etc. Defusing a bomb with 50-60 seconds remaining : 3,000 points. Defusing a bomb with 40-49 seconds remaining : 2,500 points. Defusing a bomb with 30-39 seconds remaining : 2,000 points. Defusing a bomb with 20-29 seconds remaining : 1,500 points. Defusing a bomb with 10-19 seconds remaining : 1,000 points. Defusing a bomb with 1-9 seconds remaining : 500 points. * Collect all of the flags on the early levels as there is no great threat from the boots. * Scroll bombs to the opposite edge of the screen so you can easily collect them and move back to your starting side. * At the start of each level you get a few seconds where the boots can not move. Make use of this time to get to the first bomb. * If two bombs are ticking down, get the closest one first unless the other is much closer to exploding. * Move the floor away from boots to trap them. * If you trap a boot on a single square, you can move the square away from underneath it, trapping it on empty space.